Today’s recipe is sponsored by my friends at GoodBelly. As always all opinions and thoughts are my own and I only post about brands I buy and my family loves. 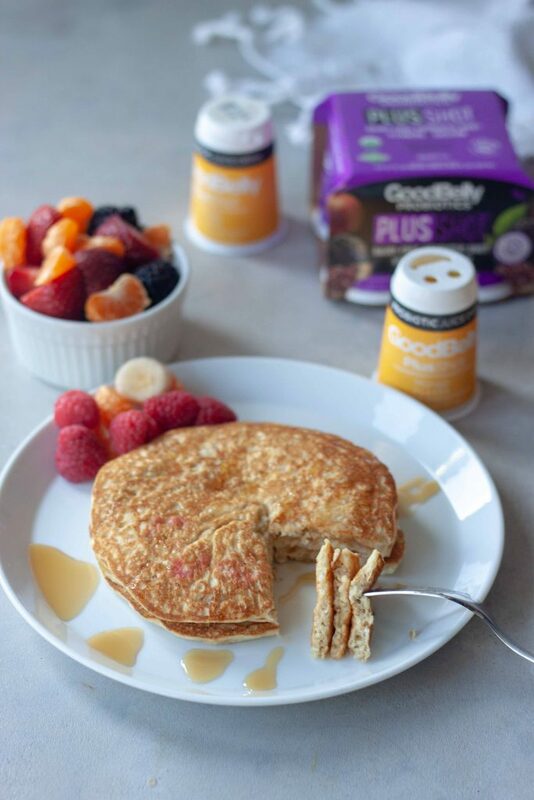 Pancakes and Probiotics make us happy! 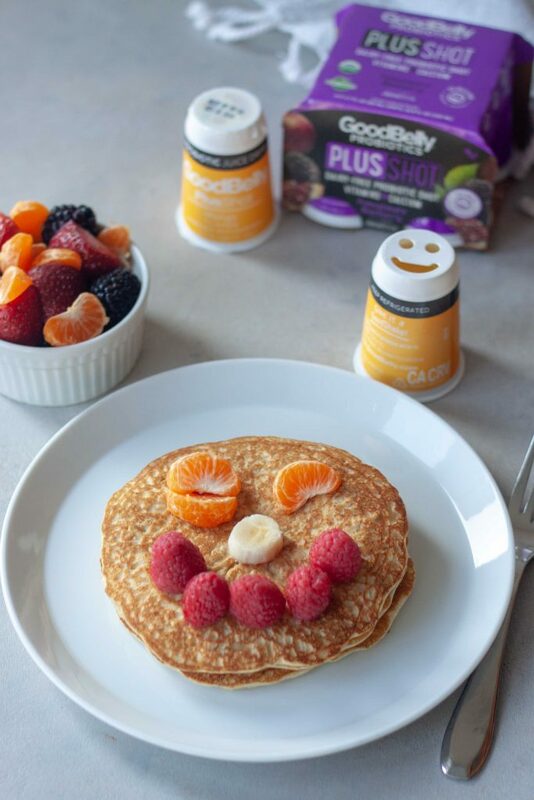 Pancakes and probiotics make us smile and our tummies happy! Pancakes and probiotics are staples in our house and the love and need is even stronger right now with me being pregnant. Yes might sound strange but craving pancakes like crazy and probiotics are even more important for helping keeping my tummy and digestive track that can slow down with pregnancy at it’s best. More than that it’s cold and flu season and gut health is an extremely important part of staying healthy. Did you know 70% of your immune system is in your gut? Probiotics are living microorganisms, which, when taken in adequate amounts, have a beneficial effect on the body. If you are new to probiotics and would like to learn more the GoodBelly website has a lot of information and a great Q&A section. Luckily our friends at GoodBelly make probiotics easy and delicious! All of their probiotics are non-GMO, dairy-free, soy-free, vegan and kosher. They even offer no sugar added options made with oat milk. Their probiotics contain well-researched probiotic strain, Lactobacillus Plantarum 299v (LP299V® for short). Some also contain vitamins, calcium, and other healthy benefits depending on the product line. The amount of probiotics also varies by product. Our favorites are the drinkable Straight Shots and Juice Drink beverages. We either drink them straight or blend into a smoothie or smoothie bowl. 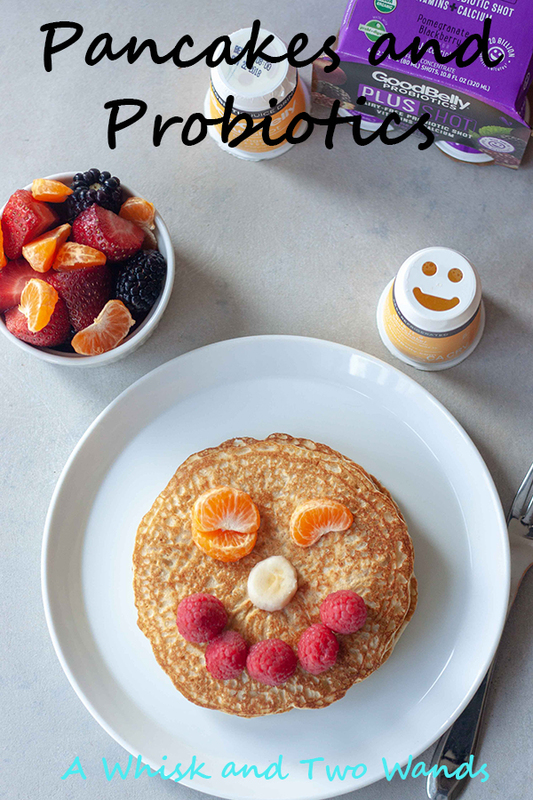 Usually the girls and I enjoy ours for or with breakfast which is why I’m sharing this Pancake and Probiotic pairing that makes us smile in the morning! My youngest daughter A even adding a little fun making our Oatmeal Pancakes smile too! I admit I left the pancakes off of my Oatmeal Pancakes and topped with bananas and maple syrup. Like the Banana Cinnamon Oatmeal Pancakes I shared over on Instagram. Later crumbling part of a GoodBelly Cocoa Peanut Butter Crunch Bar on top. Same recipe as below I just add mashed bananas and cinnamon to make them Banana Cinnamon Oatmeal Pancakes, see recipe notes. These bars have been a staple on mornings when I wasn’t feeling well and didn’t have an appetite. You can top your favorite pancakes with a smile to start the day or if you’re looking to try something new try my simple Oatmeal Pancakes with or without toppings. I decided to make oatmeal pancakes to top with our smiley faces because good old-fashion oats are a gut healthy food! Oats are a source of prebiotic fiber that live probiotics use to promote their growth or a ‘probiotic boosters.’ You want to including both types in your diet to ensure overall good gut health. 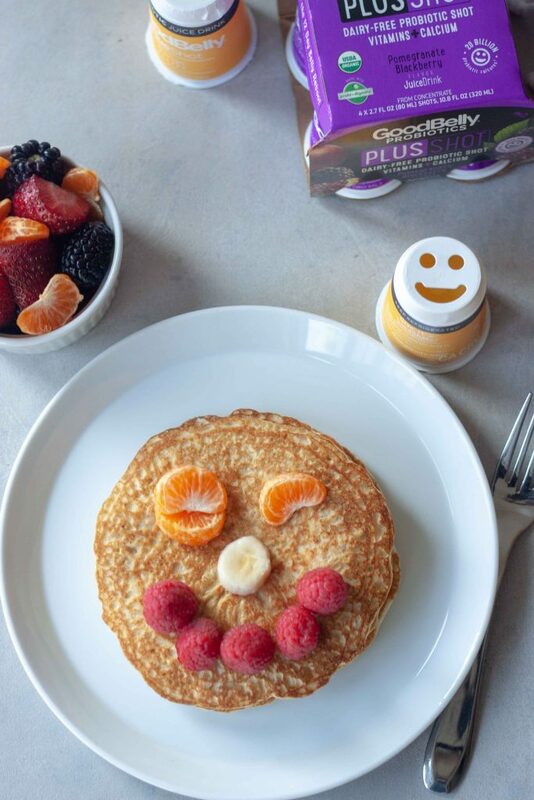 Pancakes and probiotics make us smile and our tummies happy and I think they’ll make you smile and happy too! Pulse oats for 30 seconds to a minute to chop. Add flour, oats, and baking powder to a large bowl. Separate eggs, white from yolks putting the yolks in a medium bowl as it will be mixed with the other wet ingredients. This step is optional but I like to beat the egg whites to make fluffier pancakes. In another bowl mix egg yolks (or whole eggs if not separating), milk, and coconut oil. Add wet ingredients into dry and stir to mix. Beat egg whites until stiff peaks and gently fold into the mixture. Spray griddle with non stick spray, I like coconut oil. Spoon pancake mixture on prepared griddle and cook for a couple minutes until edges start to look dry and pancakes bubble. Flip and continue cooking until golden. Top pancakes with smiley face or toppings as desired. 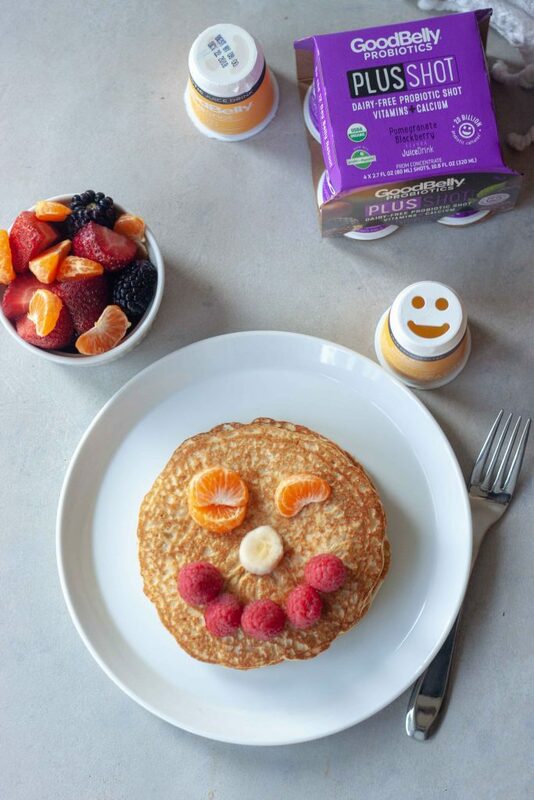 Enjoy with GoodBelly probiotics and start your day with a smile and happy tummy! *Add additional milk as needed if you like thinner pancakes. *For Banana Cinnamon Oatmeal Pancakes I mash up 1-2 ripe bananas and fold them into the batter along with a good dash of cinnamon. 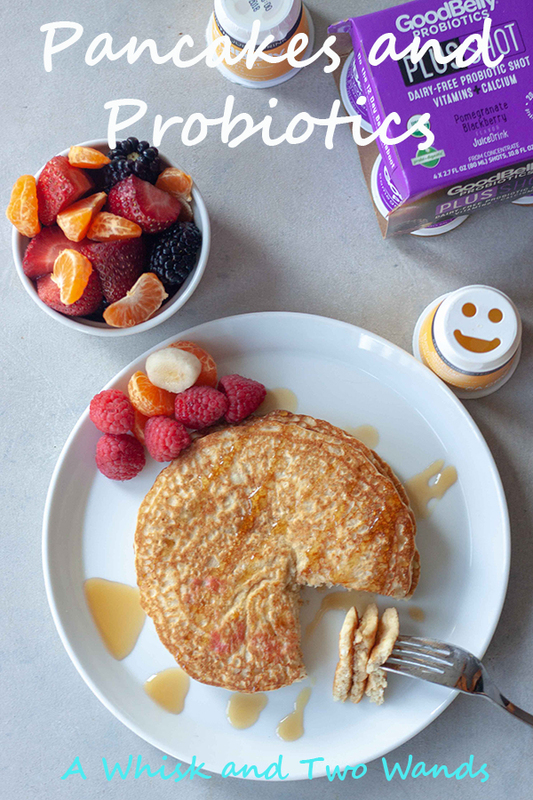 The only thing better than a winking smiling pancake is a healthier one! Love this! Even better when the kids have fun making them! Love the fruit face! Always a great way to enjoy pancakes. We always try to take probiotics each day for gut health and i love that you made some pancakes with them in it. Gut health is so important and GoodBelly drinks are the girls favorite way to get their probiotics daily. I have not had pancakes in so long-I think it’s time! YES! Pancakes (and waffles) are one of my favorite things right now! Those pancakes are lovely Sarah! And I always get a smile when I enjoy GoodBelly. Love their products! Thank you Alisa! We smile everytime we have GoodBelly too! These are all kinds of good for the tummy! Love the face, I want one on mine please.